"I'll never understand why you're so bitter about everything." Gemma Uriel is an Imperial lumberjack turned miner working in Steamscorch Mine in Kynesgrove. 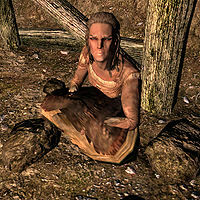 She is the sister of Ganna Uriel and traveled from Cyrodiil to start a lumbermill business in Kynesgrove; a subsequent failure, as the surrounding trees turned out to be sacred to Kyne. In order to pay the debts from the failed lumber project, Gemma reluctantly works the mine, and hacks away with her pickaxe every day between 8am and 5pm. She eats two one-hour meals a day, at 7am and 5pm, at the Braidwood Inn. Like most other residents of Kynesgrove, she sleeps in a tent in the neighboring camp, every night between 10pm and 6am. At all other times she wanders around the camp or spends time at the inn. She wears a set of regular farm clothes and boots, and wields an iron dagger. She carries a random selection of lower-class items and gold. When spoken to, Gemma will express her displeasure with her sister, saying, "Wouldn't even be here if it weren't for my idiot sister." and will elaborate with, "I can't believe she dragged me all the way to this snowball. 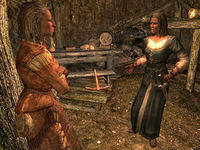 I'd rather be broke in Cyrodiil than broke here." 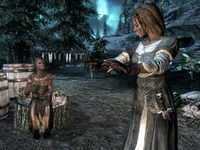 She seems to have plans for the future, though: "If these Nords don't let up soon, I might just make a break for it. At least Cyrodiil is warmer than this." She also knows Kynesgrove is a dead-end and will say, "Oh, great, another wanderer. Slumming it on your way to Windhelm?"